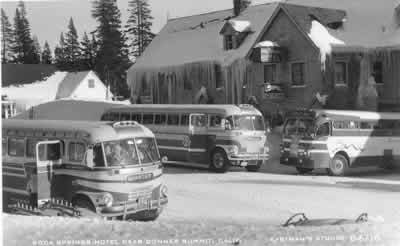 Our newsletter, The Heirloom, is one of the the best sources for stories and pictures about the history of Donner Summit. Use the indices here to look for articles and pictures you'd like to see. Use the year links below to all of our editions. Those pages have descriptions of the topics covered in each issue each year. The Heirlooms are all PDF's. Except as noted they are all of reasonable size due to judicious use of Adobe Acrobat's file shrinking capabilities. Below: outside the Soda Springs Hotel. The Hotel served as a bus station as did the store across the street and the Norden Store up the road (all for different companies). Today no buses stop on Donner Summit. "Still we continue our long ascent, leaving Donner Lake like a lost diamond in the depths below us ; we enter the long line of snow-sheds which leads to the first tunnel ; we plunge through the gathering shadows of the tunnel, and finally emerge at Summit (1671 m.), 7017 feet above the sea, the highest point of the railway, the highest point, except Sherman, reached as yet by the iron horse and the iron road in any quarter of the world. We are not, however, at the summit of the Sierra Nevada range, but only the elevation of the mountain-pass which the railroad closely follows. The prospect is one, nevertheless, unequalled for extent and grandeur. We stand on the watershed of several mountain-torrents which, after taking the most irregular and capricious fancies, and winding by rock and valley, pour their tribute at last into the one great receptacle of the Sacramento River. Towering mountain-peaks are all around, their brightness contrasting with the mysterious shadows of profound ravines; while the murmur of falling waters is on the ear, and ever and anon comes the flash of a mountain lake, like that of a diamond, set in an emerald ring. From the moment we reach the high ground of the Summit, the railroad strikes through a succession of tunnels and snow-sheds, so closely connected that for miles it seems all tunnel. The longest of these measures 1700 feet."